Police, Veterans, Military Discounts and More! We want to say thank you to the everyday heroes in our communities, our essential services that we simply could not live without. 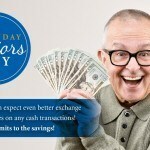 Every Wednesday at Continental Currency Exchange we’re giving back the way we know best – with even better savings! When service men and women visit any of our 19 branches across Ontario on a Wednesday, they’ll receive exclusive discounted exchange rates, no fees on all cash transactions and savings across all foreign exchange services including foreign drafts, money transfers, and wires. It’s just our way of saying thank you for everything you do, from our community to yours! We already guarantee the best exchange rates on over 160 currencies bought and sold immediately, but now every Wednesday our essential services men and women save even more. So no matter where you’re going, you can rest assured you’ve kept more money where it belongs… in your pocket. Exclusive Offers Special offers and promotions for additional savings, helping you save more and earn more on each transaction. Buying Currency Receive discounted exchange rates when you buy over 160 foreign currencies. Selling Currency Receive discounted exchange rates when you sell or bring us back over 160 foreign currencies. Cash Transactions Service men and women pay NO fees on all cash transactions. Wire Transfers Discounted fees and exchange rates on money transfers and wires. Drafts Discounted fees and exchange rates on all foreign drafts and cheques. *Call or visit your nearest branch for a complete list of Hero Day Discounts and savings. To receive your exclusive discount, all you need is valid identification which demonstrates your employment such as an IAED card for Emergency Medical Dispatchers, and you’ll be eligible to receive all the great benefits and savings of Hero Day. It’s that simple. 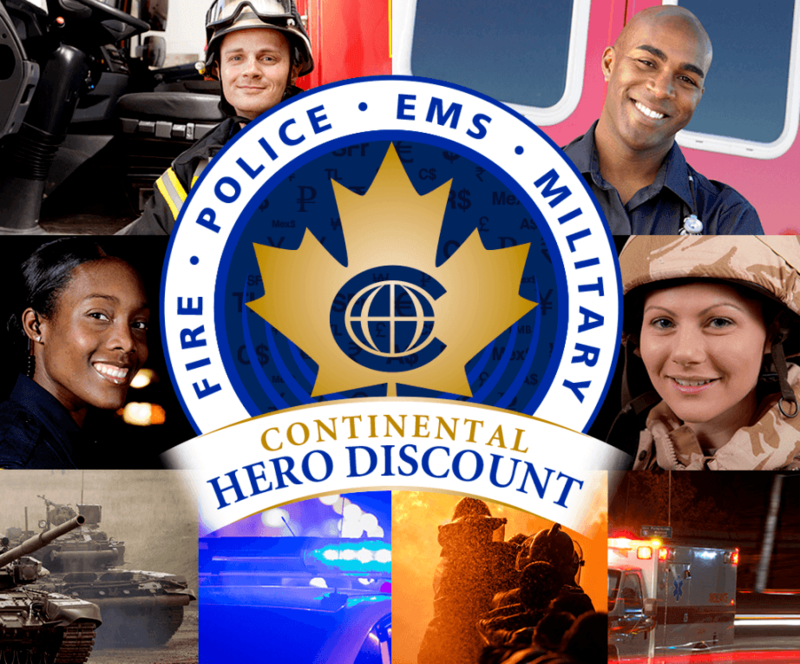 Police, veteran, military discounts and more… the savings don’t stop there! No matter what your reason for travelling, we want to offer all our heroes the biggest savings possible. That’s why combining Hero Day savings with our other great promotions and deals can help you put more money in your pocket! We understand that the life of a service man or woman can be hectic. If you want to buy on the fly, try pre-ordering your currency. We’ll make sure you get the currencies you need in the amount you want, at the best exchange rates guaranteed – and you can even request specific denominations! We know it is difficult to repay the debt our communities owe to our heroes, but we hope that with the implementation of Hero Day we can start to show just how much our essential service members mean to us here at Continental. See you next Wednesday! REMEMBER… We carry over 160 currencies on hand, ready to be bought and sold immediately (or pre-ordered), at the best exchange rates guaranteed. And if you find a better exchange rate in a local market that we can verify, we’ll beat it! It’s as easy as that. 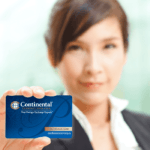 Visit continentalcurrency.ca to find your nearest branch today. Don’t forget to ask about our Privilege or VIP cards for even better exchange rates and no service charge. You can also order currency for delivery or pickup with FXtoGO right now!